This year, I decided to make use of my lovely, ripe winter citrus in my holiday decorating. You might enjoy trying this, too, for a simple, yet beautiful Christmas look. I’m not quite sure how it happened, but Christmas is really sneaking up on us. I’ve got my tree up, the holiday music is playing, and I’m about to start baking up a storm (I love holiday cookies). Don’t talk to me about shopping, though! Every year, my family and I make holiday ornaments and decorations of one kind or another. Sometimes they’re just for one season, like the time we strung popcorn on garlands (not that easy! ), or the fragile paper snowflakes we make and hang in the windows every year. Others stay on our tree for years, like the sweet, glitter-crusted cardboard ornaments my children created when they were toddlers. As you may know, oranges have long been associated with the holidays. It used to be very common for children to receive an orange in the toe of their stockings, back when fresh citrus was more of a costly luxury. In Germany, children still traditionally receive oranges, nuts, and candy in their shoes on December 6, which is celebrated as St. Nicholas’s Day. And many of us just naturally associate the beautiful color and fresh, sweet taste of citrus with holiday treats and gifting. After seeing the idea showcased on blogs and Pinterest, I decided to try drying some orange slices to hang in my windows and on my Christmas tree this year. I started with seedless navel oranges (citrus with seeds are harder to handle and don’t dry as well) and sliced them a little more than ¼” thick (PIC 1). 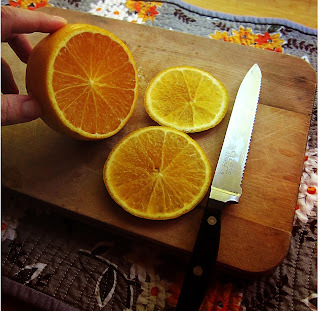 Try to slice your oranges as evenly as you can, or you will have problems later with them drying unevenly. A number of blogs suggested drying the orange slices directly on the oven rack, but I was worried that they would fall through, so I took the cooling racks I use for baked goods and put them on the oven racks, then placed the slices on those. This worked perfectly. I found that a temperature of about 215 degrees was about right, but your oven may vary. The oranges took about 2.5 hours to dry all the way. You’ll want them to be dry and leathery, with no juice remaining, but not brown. Watch them carefully toward the end. 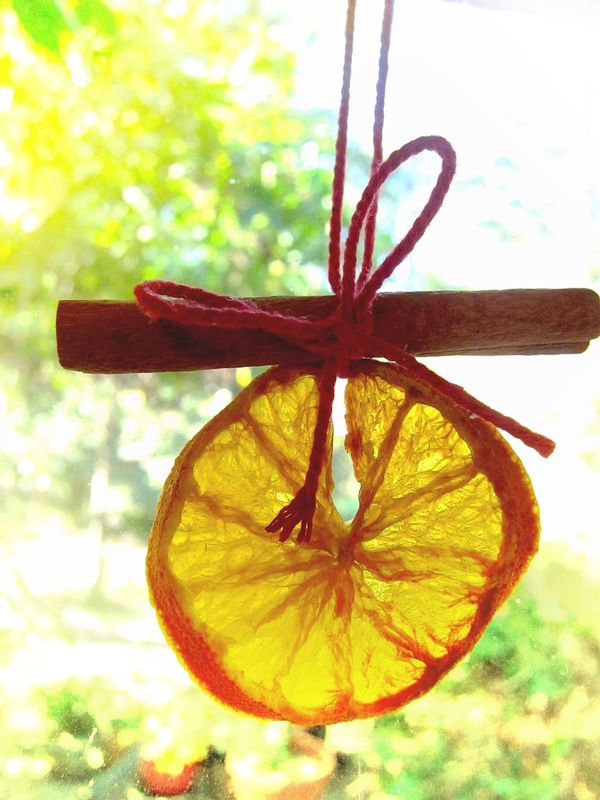 The finished dried orange slices have a lovely translucent quality that will remind you of stained glass. They look beautiful hanging in a window, strung onto a garland or a wreath or on a tree. Here’s an ornament I made on my tree (PIC 2) and here’s a simple ornament with a cinnamon stick tied on hanging in my window (PIC 3). 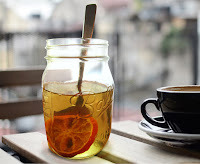 By the way, you can also store these dried slices and enjoy the orange flavor they add to a cup of hot tea (PIC 4). These lovely, inexpensive natural ornaments are equally at home among rustic décor or in a more elegant environment. Check out these more elaborate variations, prettied up with dried flowers and ribbons. Or here’s one with cranberries and cinnamon sticks. Not feeling up to drying slices? 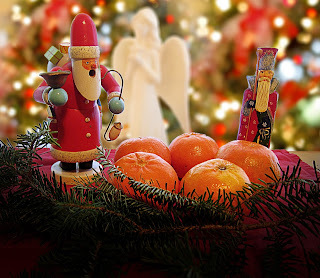 There are still so many ways to incorporate beautiful oranges, tangerines, and other citrus into your holiday décor. 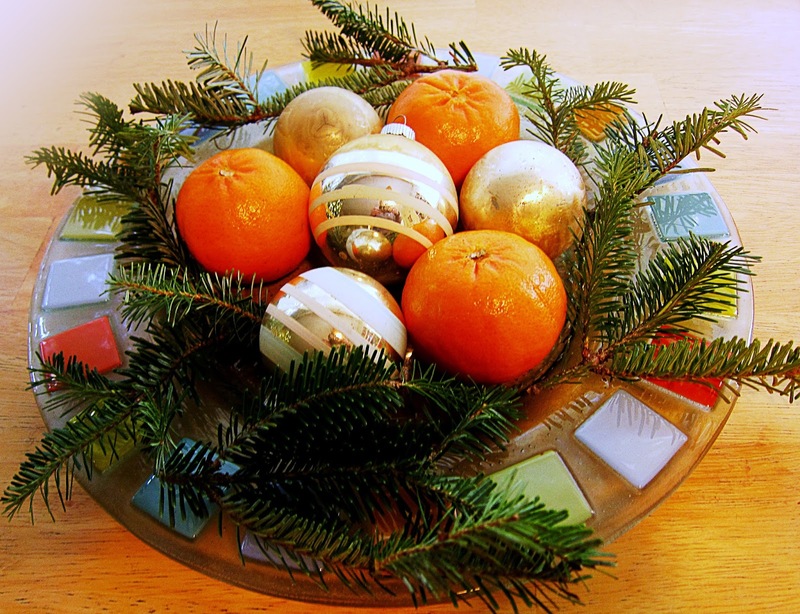 There’s not much simpler than placing a bright cloth, a few sprigs of pine or fir and some oranges or tangerines on a table (PIC 5), but it looks warm and beautiful. Or try the slightly more sophisticated look of tangerines, vintage ornaments, and fir or spruce boughs on a decorative plate (PIC 6)—a simple yet elegant centerpiece at low cost. 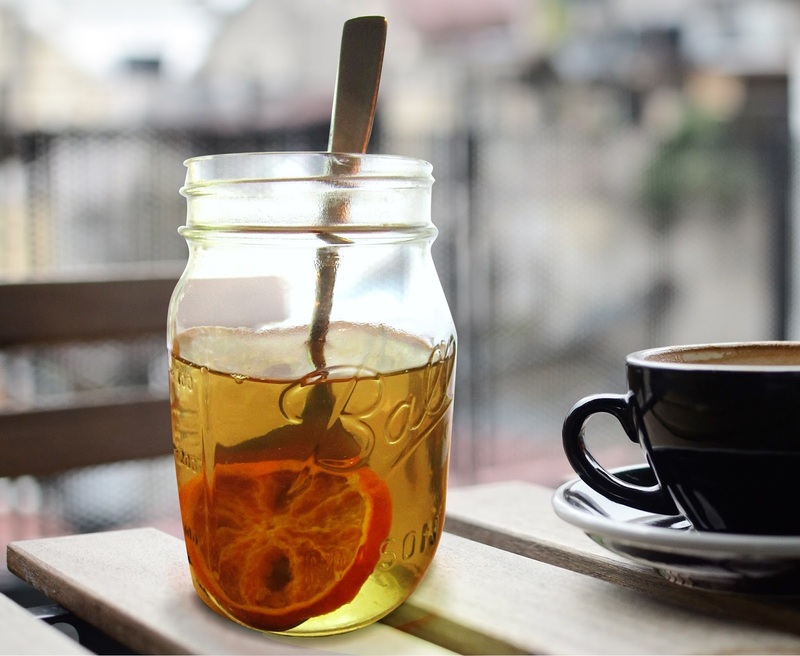 Of course, you’ll also want to enjoy delicious treats and beverages made from oranges, grapefruits, tangerines and other citrus fruits during this holiday season! 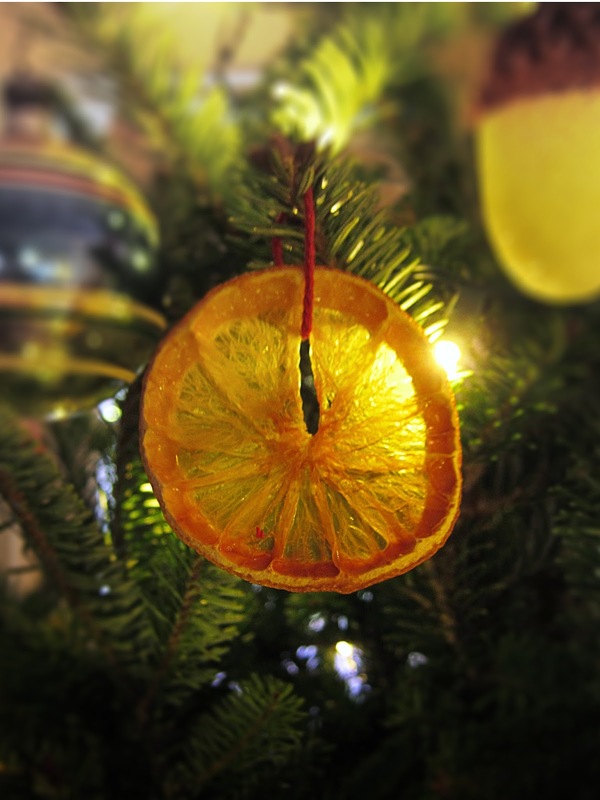 Look for other posts coming up soon with festive recipes featuring fresh citrus. Happy holidays! Want to be notified when we post more articles? Sign up for our mailing list! © 1996-2013 Vegetable Kingdom Inc., PO Box 530456, St. Petersburg, FL 33747 All rights reserved.